What if doctors have it all wrong? In the 1800’s doctors recommended cough syrup containing heroin. Is that a chronic cough, or are you just addicted to your cough syrup? In the 1940’s, mental disorders including depression and anxiety were being treated with frontal lobotomies. You don’t really need that part of your brain, do you? Yet, grave medical mistakes like these don’t happen in this day and age… or do they? …and it’s likely one of the deadliest we’ve ever seen. I’m referring to the medical mistake of using estrogen to treat many symptoms of menopause, including hot flashes and flushes. Sure, estrogen is effective at reducing the symptoms of hot flashes. Apparently doctors are not concerned about those, and therefore, you shouldn’t be either. That’s a little scary isn’t it? Treating hot flashes with estrogen is kind of like treating depression with a lobotomy. No, the existence of the frontal lobe of your brain isn’t the cause of depression any more than estrogen deficiency is the cause of your hot flashes. If estrogen deficiency was the cause of hot flashes, then it would make sense that women who suffer from hot flashes would be “more deficient” in estrogen than those who do not. However, according to renowned hormone physiologist Dr. Raymond Peat, that’s not the case at all. A natural decline in thyroid function. An inhibition of progesterone production. An increase in stored estrogen within cells/tissue. An increase in activity of the estrogen producing aromatase enzyme. While estrogen production may decline, progesterone production declines more severely resulting in estrogen dominance. It’s important to understand that it’s the balance of estrogen to progesterone that matters most. In menopause, the more estrogen dominant and progesterone deficient you become, the greater the danger to your thyroid health. 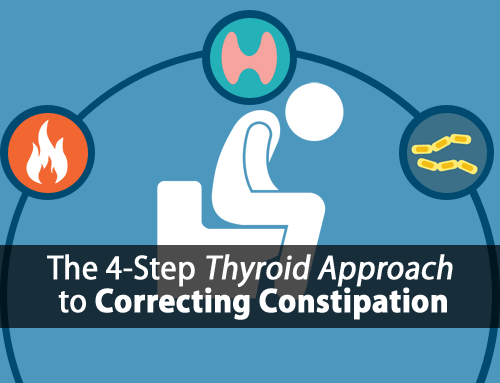 There are certain points in a woman’s life when hypothyroidism either develops, or worsens. 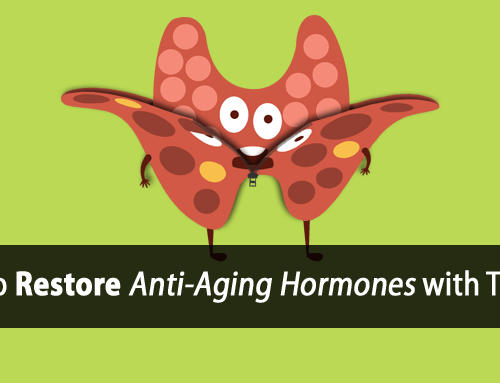 Menopause is one those times due to the thyroid-suppressive effects of estrogen dominance. Inhibiting the proteolytic enzymes that allow your thyroid gland to release its thyroid hormone, directly blocking your thyroid gland. 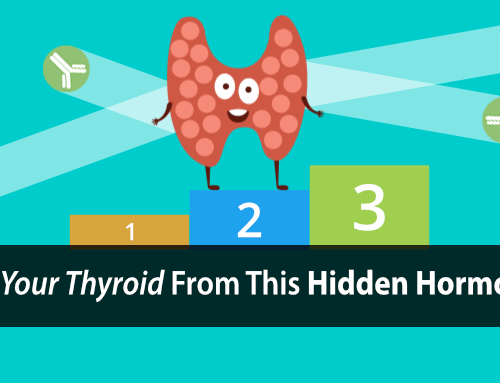 Blocking your liver from converting inactive T4 thyroid hormone into the active T3 thyroid hormone your cells need to survive. 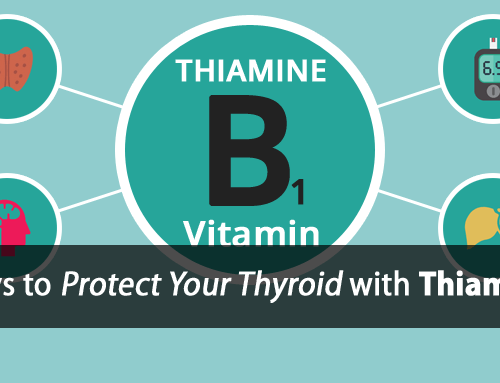 Blocking your metabolism and preventing you from using thyroid hormone efficiently. While the exact mechanism(s) that cause hot flashes are still not entirely understood, there are certain triggers that are well known to produce hot flashes, which can be corrected. Some studies have demonstrated that hot flashes can be triggered by certain imbalances, and that correcting those imbalances can effectively prevent or reduce the risk of a hot flash occurring. What’s interesting is that these imbalances are also commonly found in hypothyroidism and caused by estrogen dominance. If these hot flash triggers are caused by estrogen dominance (and hypothyroidism), then why would estrogen improve hot flash symptoms? How can something be both part of the problem and the solution at the same time? This is exactly what continues to confuse so many. The truth is that while large amounts of estrogen may alleviate the severity of hot flashes, it’s certainly NOT part of the solution. Studies show that estrogen effectively lowers both body temperature and the environmental temperature at which your body begins to release heat. Chronic hormone replacement therapy alters thermoregulatory and vasomotor function in postmenopausal women. The higher your body temperature (more heat) and the faster the flash (release of that heat), the more severe the hot flash. Supplementing estrogen both lowers body temperature (less heat) and slows the flash (release of heat), thus reducing the symptom. In other words, it’s not fixing the problem. It’s just making it less severe. That makes estrogen great for your hot flashes, but (as we’ve already established) horrible for your health. It’s never a good idea to try to solve one problem only to create a bigger and more serious problem in the process. Instead, focus on fixing the underlying cause of your hot flashes by fixing these three hot flash triggers. As mentioned previously, progesterone deficiency is common in hypothyroidism. Not only is progesterone deficiency known to promote hot flashes, restoring progesterone levels is known to prevent them. In this study of early menopausal women, 300 mg was shown to be effective against severe hot flashes. Also, when the progesterone was stopped, the hot flashes didn’t come back with a vengeance as they do when you stop estrogen. 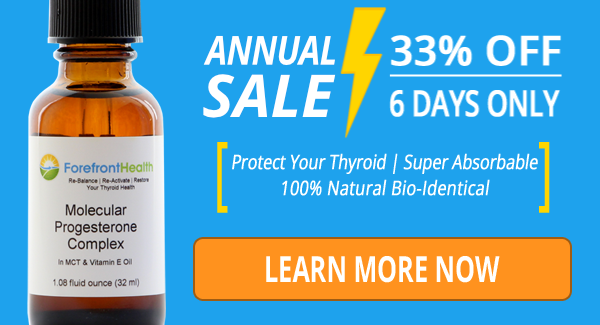 Nitric oxide levels are known to rise in hypothyroidism, estrogen dominance, and in response to severe traumatic stress. It’s also known to trigger hot flashes. Nitric oxide synthase inhibition attenuates cutaneous vasodilation during postmenopausal hot flash episodes. Research also shows that inhibiting nitric oxide can prevent or stop hot flashes from occurring. 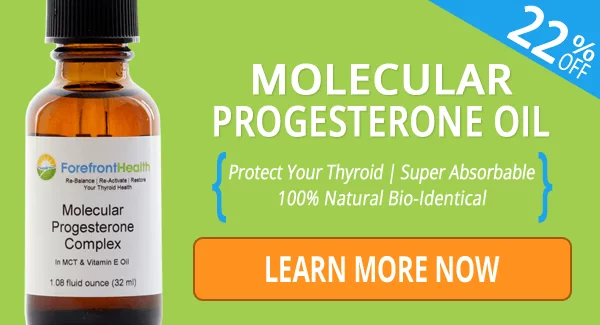 Regulating thyroid function and metabolism will effectively lower nitric oxide levels, as can addressing the underlying estrogen dominance, which we often do with our Molecular Progesterone Oil and our Vitamin E Complex. Hypothyroidism is also well known to promote blood sugar issues and hypoglycemia, due to hypothyroidism’s effects on your liver. Being hypothyroid and prone to low blood sugar also makes you more susceptible to hot flashes. Menopausal hot flash frequency changes in response to experimental manipulation of blood glucose. This is why hot flashes tend to occur more frequently at night when blood sugar is often lowest and during times of stress when blood sugar is used up more rapidly. We always recommend eating the proper balance of nutrition, and frequently enough, to keep blood sugar stable. Hypothyroidism is very common in menopause, and needless to say I’ve worked with a lot of menopausal clients. 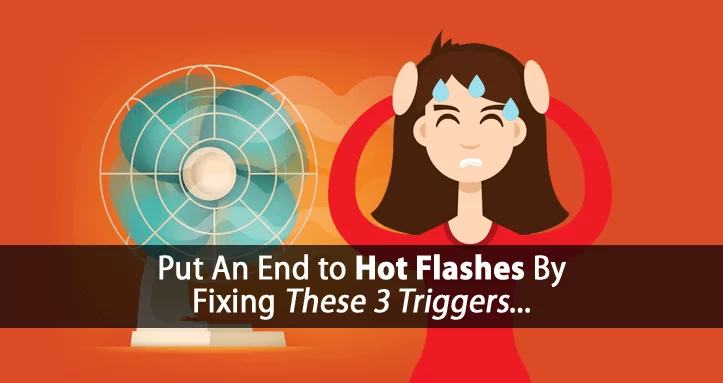 Correcting these three hot flash triggers has been instrumental in alleviating hot flashes with many of them. Yet, it’s not only menopausal women who suffer. I’ve also worked with non-menopausal women who experience hot flashes, and these same tips apply to them as well. Unfortunately, the current medical approach to menopausal symptoms and hormone replacement therapy is extremely dangerous. …especially when there are other viable options, like progesterone supplementation, that can fix hot flashes and protect you from these very diseases at the same time. I am 29 years old and was diagnosed with hypothyroidism when I was 19. I have been taking Synthroid ever since. I have dramatically cleaned up my diet and lifestyle over the years and my hormones all seem to be “within range” based on blood tests (which is why I am apprehensive to try progesterone or any other type of hormone). For the last 4 or 5 years or so, I notice that the few days leading up to and during my period I get these strange hot flashes (or what I think they are considered hot flashes). I’ll get super hot for about a minute and my face turns bright red a few times a day. It’ll cool off a couple of minutes later but its so intense that people ask me if I’m okay and that I’m so red out of no where! This doesn’t happen too much during the rest of the month, just the 3 or 4 days prior to and the 3 days during my period. Aren’t I way too young for that? What could this possibly mean? THANK YOU. I’m 53, post-menopausal, and I’ve been working with a functional med doc for my hashis and hypothyroid. My hot flashes were unbearable when I stopped HRT. She put me on bio-identical prog and estrogen, but my hot flashes were coming back worse, so she upped my bio-identical estrogen. All that did was make me fatter and feel worse. My BT was averaging 96.4. I’m on NDT and T3 (a lot of it) but I knew it wasn’t getting through, especially since my BTs are so low. This explains SO much. Thank you for all your helpful info. I’ve stopped the estrogen cream and will start your progesterone oil as soon as it arrives. I have a question ,, on the bottle it says 3 mg progesterone in one drop, and it reccommends 3 to 4 drops several times per day. but in the article on hot flashes … 300 mg per day is needed. That would be a hundred drops per day .. is that what he’s saying? Hi Toos, that research study was for patients with severe cases of hot flashes/flushes. In some cases, large amounts of progesterone are necessary and warranted. Interesting article. I had to get off my bio-identical estrogen (long story), but stayed on my bio-identical progesterone. 6 months later, I’m now testing hypothyroid via low T3, whereas my thyroid panel has always been in the normal range when I was on supplemental estrogen. Your article says that estrogen dominance can block the liver from converting T4 to T3, but it seems that my conversion is now worse when I am no longer using estrogen therapy. I have had hormone tests in the past to check my hormone levels – saliva, blood, urine – none of these tests indicated estrogen dominance, not even when i was on estrogen. In fact, all the tests would indicate the opposite that I probably was under-dosed with estrogen, as I was often barely or not even in the post-menopausal range, but progesterone was good. I’ve been post menopausal for 3 years. So, in your opinion, does estrogen deficiency even exist and if so,what are the symptoms and how do you treat it, if not with supplemental estrogen?